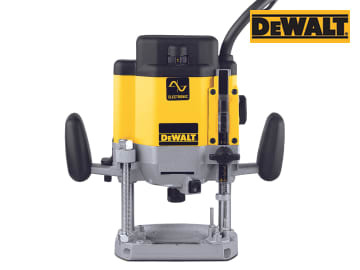 The DW625EKT Double Collet Router has electronic speed control that ensures that the same fine finish is achieved in all grades of timber, aluminium and plastics since the full wave electronic control ensures the selected speed is maintained under any load. The soft start eliminates small initial movements that might misalign the cutter, especially important with such a powerful router. Routing depth setting with fine adjustment and magnified scale for simple setting. The two column precision guide has large phosphor bronze bushes for plunging accuracy. These are set in a high quality die cast aluminium housing so that carefully controlled plunge cuts can be made. It has a spindle lock mechanism for quick and easy cutter changes with a single spanner and a compact low profile design that provides easy handling and increases stability. The router is fitter with large comfortable handles with the on/off switch and plunge lock at your finger tips for excellent control and there is a dust extraction through the base mounted spout for virtually dust free routing. The 3 stage depth stop adjustment enables recesses of various depths to be machined in one operation without time consuming setting up. Supplied with: 1 x Parallel Fence With Fine Adjustment, 1 x Dust Extraction Adapter, 1 x 6.35mm Guide Brush, 1 x 12.7mm Guide Brush, 1 x Spanner and 1 x T-Stak Case. 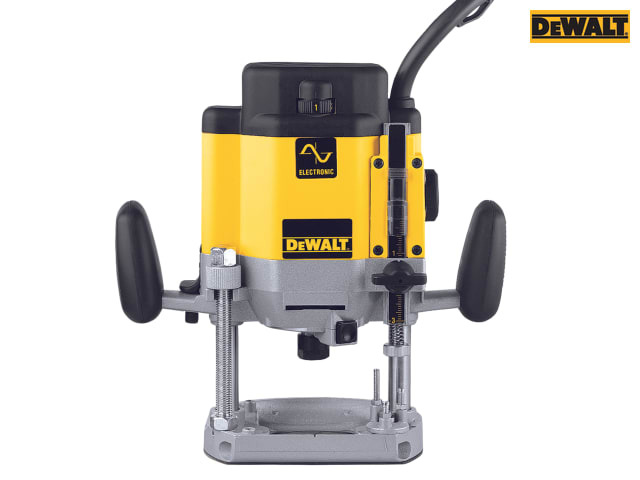 DEWALT DW625EKT Double Collet Router 2000 Watt 240 Volt Version. 1 x DW625EKT Double Collet Router 2000 Watt 240 Volt.